After having issues with my digestion, I decided to eliminate wheat and gluten from my diet. I did this not because I had to, but because I strongly believe gluten causes inflammation in the human body. And inflammation leads to all sorts of health concerns and diseases. Additionally, wheat has become so over-processed in America, that it is no longer healthy for anyone to consume. Since I eliminated wheat and gluten from my diet, I have felt better than ever. I have more energy and truly feel and look younger. My digestion is at it’s optimal. My hair, skin, and nails simply glow. You too will be amazed at how much better you will feel when you eliminate gluten. I have always been passionate about diet and health, and the direct connection between them. I was raised eating a healthy and organic diet. I truly believe you are what you eat. I never eat anything that I cannot pronounce or identify. That concept is what prompted me to start Island Girl Bakes. My mission is to produce fresh baked organic gluten free breads and baked goods that not only taste amazing, but are also good for you and will make your belly happy. I started Island Girl Bakes on the Big Island of Hawaii in November of 2010. I wanted to provide people like myself with healthy alternatives to wheat based breads and desserts. As I changed to a gluten free diet, I was so challenged by the options in the stores. Every gluten free item I picked up off the shelves in the Health Food stores were filled with preservatives, refined sugar, or corn related products that I did not want to ingest. Not to mention, every item I sampled did not appeal to me. I decided to try baking gluten, yeast, and sugar free breads on my own. Being a long time baker, I was up for the challenge. It was a bumpy road of experimentation, but I loved it!! My first creation would have to be a sandwich bread. That is my passion and weakness– toast with butter. Being raised as an Italian, I was constantly eating fresh baked semolina bread from NYC bakeries. I toasted the bread and spread it with butter every morning for breakfast. On this new gluten free diet, I was lost without my bread and butter. So I was thrilled with my first creation – the Heavenly Quinoa bread. Packed with nutrition and protein, I lived off this new bread. I looked forward to eating it every day. 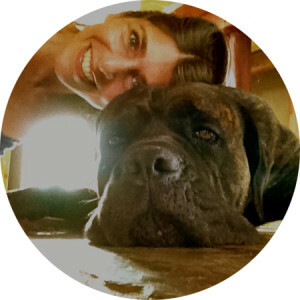 My Italian Mastiff, Gino, was my faithful taste tester. He is gluten free too. The quinoa bread is his favorite treat, more so than dog bones or even beef or chicken!! To this day, Gino and I share 2 slices of quinoa bread a day – it is our ritual. I do not think we have missed a day!! It even goes on the road with us when we deliver our breads to the local stores. My friends started tasting the Quinoa Bread and loved it. They asked me if I would make loaves for them. The orders started pouring in via word of mouth, and the business started to grow. Next thing I knew, I was driving around (Gino in the back of my SUV with me, of course), hand delivering my breads to customers all over the Big Island. My clients asked me if I had any other items. That inspired me to go back to the kitchen and experiment. Now, it was time to develop some new recipes. And, I had clients patiently waiting for my new creations. I came up with the perfect gluten free flour blend, a combination of rice and tapioca flours, that made all my dessert breads taste just like delicious wheat based products. Moist, soft and melt in your mouth breads. First came the ultimate sandwich bread, the French Style Rice Bread, which reminded me of the French Breads I used to eat all the time. Next came the dessert breads. First, the Perfect Pumpkin Bread, then the Bomb Banana Bread, followed by the Zen Zucchini Bread. I couldn’t believe I was able to do it. Gluten free breads that were moist and delicious, not dense, dry and hard, like the ones I had tried from the stores. I decided to invent some energy bars and dessert bars, because I love to have things to take with me while I am on the road or when I take long hikes. I wanted something that gave me sustained energy and not the sugar spike so many energy bars do. I opted to use brown rice syrup as a sweetener. It is a low glycemic index sweetener, which gives you a sustained energy and keeps your blood sugar levels stable. The Almond Energy Bar and Lava Power Bar were born. I developed the amazing Big Island Bar for the chocolate lovers. It is a decadent healthy treat, filled with fiber, healthy nuts and oils, with a subtle sweetness. It has no added sugar, but once again, uses brown rice syrup as a sweetener. I melt dark 72% cacao chocolate on top. PURE HEAVEN. The added benefit is that cacao (the healthy part of the chocolate bean) is a superfood, packed with antioxidants. Finally a treat that tastes great, not too sweet, and is good for you. Lastly, I decided to create a spread to put on the quinoa and rice breads. I wanted a substitute for peanut-based spreads and I love the salty sweet combination. Sometimes, I want to add a little sweetness to my quinoa bread. And so my Sweet N Salty Spread was born. The ultimate spread and dip for breads, gluten free pretzels and crackers, fruit, and veggies. You can even dip summer rolls in it as a substitute for the peanut-based dip. Some people use it as a marinade on tofu and chicken and fish. Once I had the products developed, it was time to get them available to all my customers. And it happened so magically and has been a dream come true. 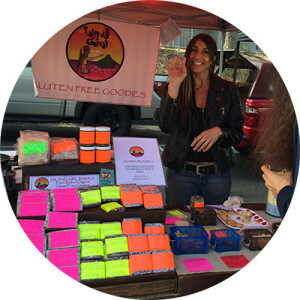 From being on the shelves in so many health food stores on the Big Island of Hawaii where Island Girl Bakes was birthed to becoming an instant success in San Diego, starting at local farmer’s markets. 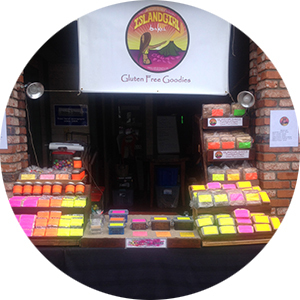 Now Island Girl Bakes is located in Encinitas, California, where we are providing our customers with our amazing gluten free goodies at over 6 local farmer’s markets, three days a week. You can also find our products in San Diego coffee shops. Additionally, we ship our fresh made goodies to all our customers via our online store. And what an amazing journey it has been. I receive letters and phone calls from so many people, so grateful to have gluten free goodies that are both tasty and healthy. I feel so blessed to help so many people day after day. It is my mission to make my products available to everyone who needs and loves healthy and nutritious gluten free goodies. Fresh baked and delivered to your home with love. I am thrilled to provide you with products that will make you feel more vibrant and alive, just like me. I hope you love my products as much as I love making them! !